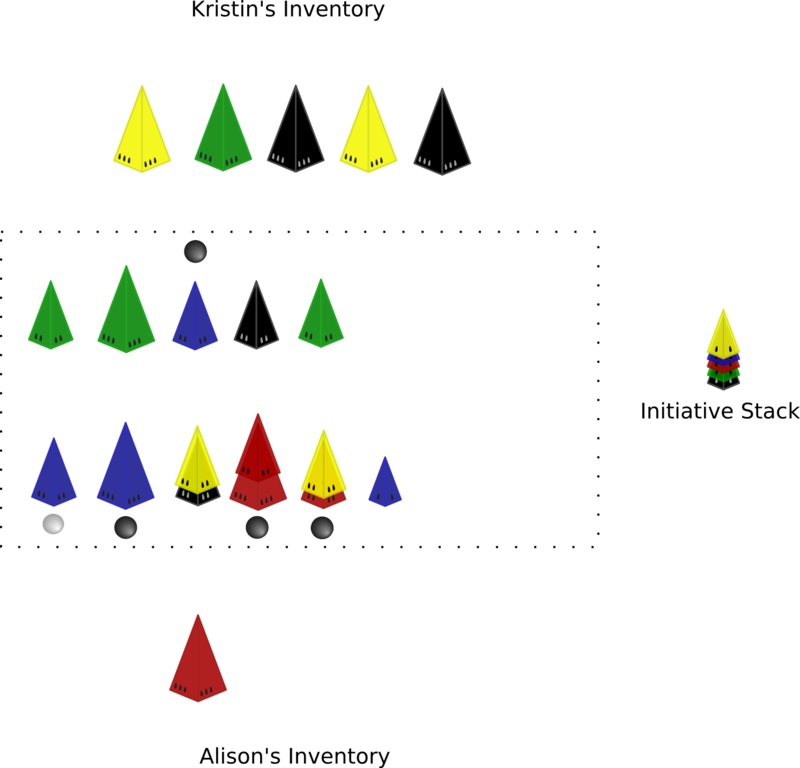 Initiative is an abstract fencing game of perfect information where one player attempts to place a pyramid that his or her opponent cannot parry. 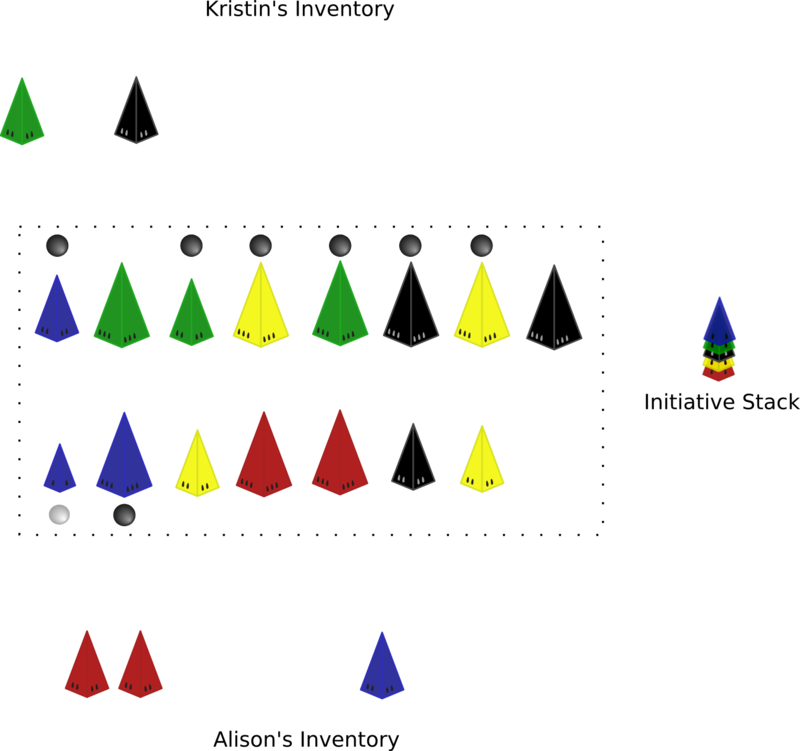 Initiative is played on any flat surface where each player places their pyramids in a row, across from the other player’s pieces, until one player is unable to play or both players run out of pyramids. The precise rules of play are described below. Before beginning, take 5 pyramids, one of each color all the same size, from the set of available pyramids and pile them one on top of each other in any order and set aside. This structure is called the initiative stack. The initiative stack describes the precedence of the colors. That is, the color higher on the stack trumps a color lower on the stack, this precedence will determine which player gets to lead on a turn; that is, who has the initiative. To get started with Initiative just randomly mix the remaining 25 pyramids into a container (an IceDice bag works well). Once mixed, one player can roll the pyramid die 10 times, each time blindly taking a pyramid from the bag corresponding to their choice of size (as indicated by the die face). Once 10 pyramids are taken the other player takes 10 of those remaining. The image below shows the typical layout of the playing area for two "fictional" players, Alison and Kristin. The player who has experience in fencing goes first, otherwise a quick game of Rock, Paper, Scissors or [Pew Pew, Die][pew-pew] can determine who goes first. This is a good way to get started quickly to explore the mechanics of placing, parrying and initiative, but a drafting system is described later that provides more control over each player’s pyramids. If you have a piece of the same size, then it must be played. You are not forced to play the same color if you have more than one piece of the attacking size. If you’re able to place a piece for parrying then the rules for who goes first (attacks) on the next turn are next. And that’s all the rules for the basic game. The following image shows the result of a game played using the inventories shown earlier for Kristin and Alison. This is just one possible scenario for illustration and not meant to show optimal play by either player. The black and white stones shown are not needed for your own game and are shown only to mark the starting pyramid (white) and the changes in initiative (black). Kristen, having kept initiative places a large green. Alison parries with her last large pyramid, a red. Finally, Kristin places a large black and because Alison has no more large pyramids nor smaller black pieces, she has lost. The sample round thus concludes with Kristin scoring 24 points, but how was it calculated? The basic scoring for Initiative are as follows. Therefore, Kristin won the round with 24 points because she had 8 pyramids in her play area and won the round with a large pyramid, worth 3 points. There are additional scoring possibilities in the advanced rules section below. The rules above are for the basic attack and parry rules. 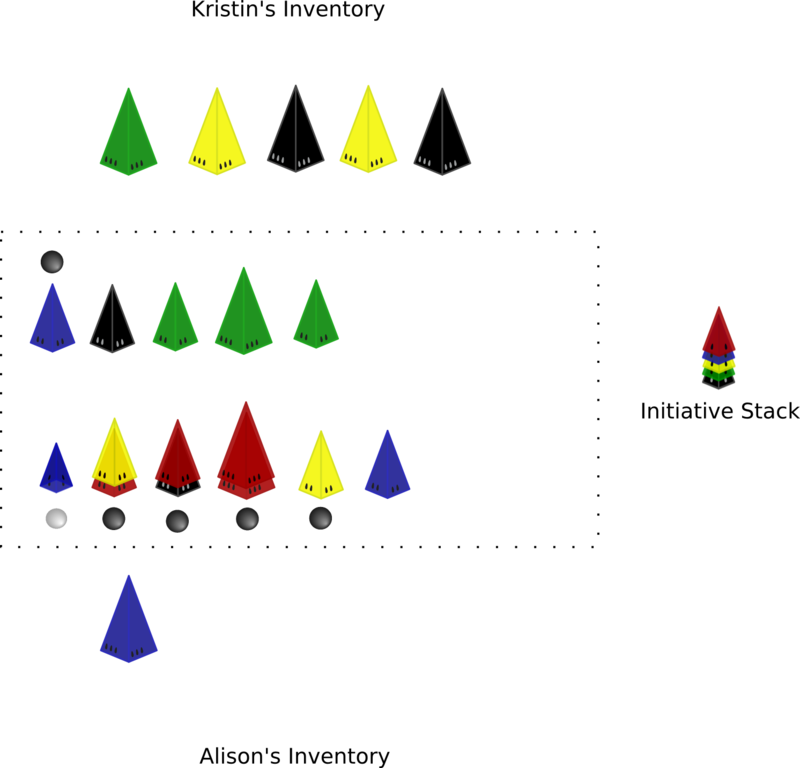 As an additional test of skill, the players can swap their set of pyramids and lead with the same set as the previous round to see who gets the higher score. The player with the highest overall score is the winner of the 2-round match. While Initiative’s basic rules are somewhat interesting, the depth of play is shallow. Therefore, you should consider playing with the following additional rules to add depth and variability to the game once you feel comfortable with the basic game-play rules. As you saw in the play-through above, it was clear that Alison was going to lose before the end, yet she was forced to play out the remaining few pyramids. If the initiative stack had been organized slightly differently then Alison might have had a chance to win, or at least to maintain or gain initiative more often (or maybe lost sooner). Through a technique called “sacrificing” a player can indeed manipulate the initiative stack and move colors up and down the stack from 1 to 3 slots at a time. To sacrifice a piece, a player only needs to place it under the pyramid that they wish to play on their turn. That is, the player plays two pyramids on a turn, the one on the top being the placed piece and the one on the bottom being the sacrificed piece. The size of the sacrificed piece then gives them 1 to 3 points (small = 1, medium = 2, large = 3) for use in making piece swaps on the initiative stack. A piece swap on the initiative stack means that the color of the played piece can be moved up or down the initiative stack the number of slots indicated by the size of the sacrificed piece. This allows the player to redefine the color precedence and (potentially) make their placed color higher or lower on the stack for the purpose of retaining initiative. But beware, either the attacker or the defender can sacrifice on any play, so the initiative stack might change a few times during a round. Finally, Alison places a small blue and since Kristin has neither a small piece nor a blue piece, she has lost the round. Alison’s score for the round is 9 points. By sacrificing pieces a player can gain or retain initiative from one play to another. Also, sacrificing allows players to get more pyramids into the play area for the purposes of increasing their round score. It’s a powerful technique, that adds much more depth to the play of any given round. Failing to sacrifice at a crucial moment could spell disaster for a player. In the figure above, the player ran out of pieces before the round was over so the last piece, a large blue, is used as the played pyramid for the remaining turns. Pummeling in Initiative is a risky maneuver as an opponent can continue to manipulate the initiative stack and weaken your pummeling piece, but the rewards of a successful attempt are vast. That is, every virtual play by a pummeled piece doubles your final score in the end. In the figure above, the pummeling player could double, then redouble, then again double, and double again, and then redouble their score for a final score of (310) 2 * 2 * 2 * 2 * 2 = 960 points! This particular circumstance would indeed be a rare occurrence, but wins with 1 or 2 pummeling turns happen from time to time. 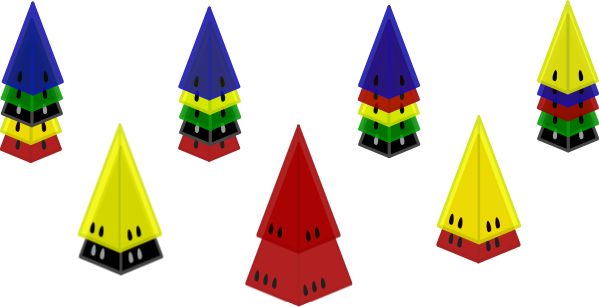 During a turn a player may lead with a small pyramid and force the play of its color. This action is signified by laying the pyramid flat on its side facing your opponent with its sacrificed piece (if any) also laying, but inside the small. The parrying player must play a pyramid of that color on their defensive attack and cannot sacrifice that color only on that turn, but they can still sacrifice any other color that they wish. In the figure above, Alison started with a small blue and chose to call its color, forcing Kristin to parry with her only blue. The rest of the round played out using both sacrifices and piece attacks. Every called color made in a round (by both players) causes the total score to be doubled. For example, if both players sacrifice once each then the final score for the winning player is doubled and then doubled again. Once a player gets 10 pyramids he or she must stop. The other player can continue alone until they too have 10 pyramids. 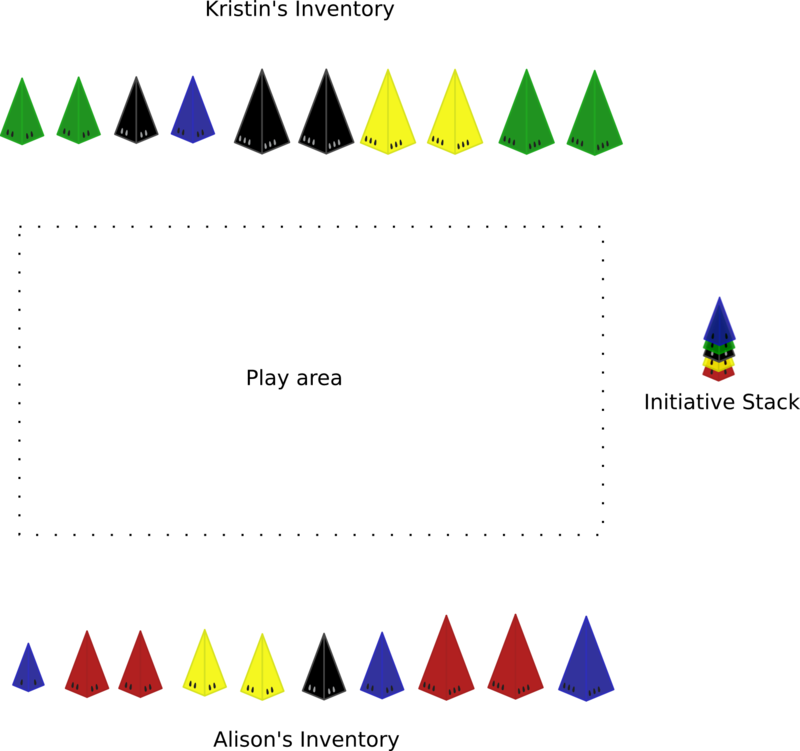 Once both players have 10 pyramids each the match can begin. Initiative is inspired by Mate and is an adaptation for play using Icehouse pyramids with some additional rules added. The drafting mechanism is (obviously) inspired by Coloretto.